Hello again all Exodus fans and readers! We've had a great last month here at Existence Games and hope all of you are doing well too! There's an exciting announcement for you in this newsletter (several great announcements actually), but first let's cover a little news! Thanks again to everyone who attended and came by our booth! You made our trip worthwhile! While at the show, Existence Games also had an awesome interview with Gaming With Scott! Click the banner below to listen and hear some great insight from one of the game creators. We'll soon be joining TalkingClockwise for another podcast session later this month! Stay tuned! Exodus, as many of you know, is a game made especially for the players, and because of that, our gamers have always been so special to us. We constantly listen to what you have to say and strive to not limit anyone in their playing. While, yes, we don't release expansions as fast as other TCG companies, we take the time to completely flesh out each set and make sure all of our cards are balanced with each other so that you don't have to worry about ban-lists, set rotation, or card reprints. We're going at a little bit of a slower pace to ensure that this card game isn't going down any time soon, and you guys can keep enjoying Exodus The Trading Card Game! Speaking of how much we love our players, one of us recently wrote a message for all of you. I've had such an unbelievably amazing time over our last few conventions, getting to know some of our players through Exodus demos and events. The people we meet and introduce our game to are so genuinely friendly and ready to have fun, and it's a whirlwind of excitement to see and be a part of. For Jake and I, it makes all the work we do so worthwhile just to share some good smiles and a few laughs through our game. We often hear feedback from players telling us how much fun they've had with Exodus and thanking us for making a great product, and it's always been our honor to be able to deliver that bit of joy. I just want to say though that the amount of pure happiness and indescribable excitement that Jake and I personally get when we hang out with all of you awesome players is so beyond words, we can hardly keep our smiles in, and we're just utterly thankful. 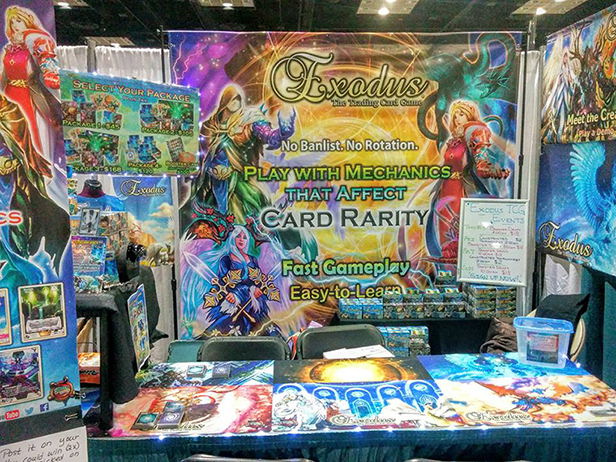 To every player of Exodus, online viewer, and people who just tried the game out or stopped by our booth at a convention: you guys give us just as much joy and make us so ecstatic to keep bringing you new Exodus releases and push forward in our business. You're more to us than just random people who buy our products and take the game off to their corner of the world, but treasured players, followers, and friends who make a difference in our game and return your contagious excitement back to us. I'm just so thankful to see such a great community for Exodus The Trading Card Game, and it's awesome how you guys support each other at events while still having competitive fun! It's beyond what we could've hoped for for our game, and I hope all of you know how ridiculously incredible you are. So once again, this goes out to all of you reading this, thank you for the great support and love you give to us and each other! You're the reason we have an epic playerbase that's continuing to grow. Thanks from the bottom of both our hearts, and we hope you'll continue to keep those bright sparks lit and keep sharing the game with others! You've certainly fanned our flames of happiness! 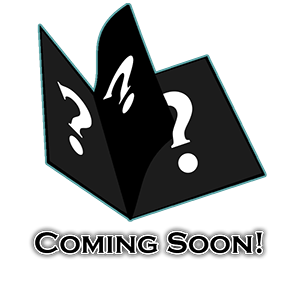 Coming this Winter, Exodus The Trading Card Game will be releasing its first and very own print magazine issue! This book will contain not only info on, but spoilers and first looks at the next Exodus expansion that's coming very soon! You might even find out what the set name and logo is, get a first look at some new artwork and creatures, and learn in-depth information on this set. There'll be plenty of other content and great topics packed into this issue's pages as well, so don't miss the event! There may or may not be a little rumor about getting an exclusive promo card with your magazine too...Find out and see this Winter! One topic that we're covering in the magazine actually involves YOUR help! We're writing a column of helpful and insightful player tips and feedback, so if you've got a great winning combo, deck strategy, advice for new players, or tips on how you like to play, trade, or open cards, tell us! 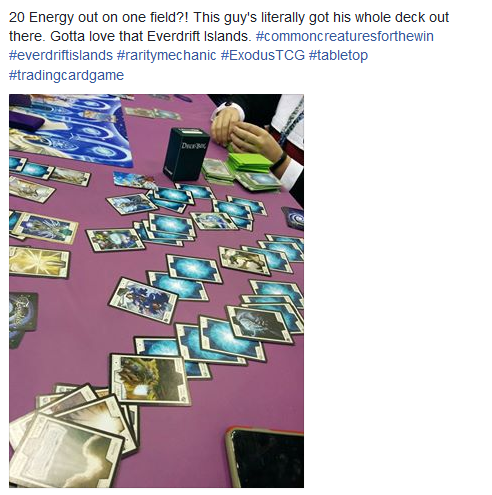 Also, feel free to write about how you found Exodus The Trading Card Game and why you like it. We want to hear your story, and this is your chance to share your thoughts with other players! We'll pick several of our favorite comments and feature them in the upcoming magazine. To participate, send us a message either through the Exodus Contact Form, email at exoduscardgame@gmail.com, or message on our Facebook or Twitter pages. We can't wait to read your input! This weekend from September 3-4, we'll be attending Gateway Strategicon in LAX, CA. If you're coming or are in the area, come play in our Exodus tournaments and drafts in the upstairs La Jolla ballroom, and play with the creators personally at the downstairs booth. We've got BRAND NEW promo cards to give out for this convention, so don't miss us! On September 17, we'll be at Colossus Con in Merced, CA. Come find us for free demos, giveaways, and match challenges! For every $5 you spend at our booth, you'll be entered into a raffle to win an Exodus Uncut Sheet! September 23-25 we'll be attending Fandomverse Expo in Lancaster, CA! 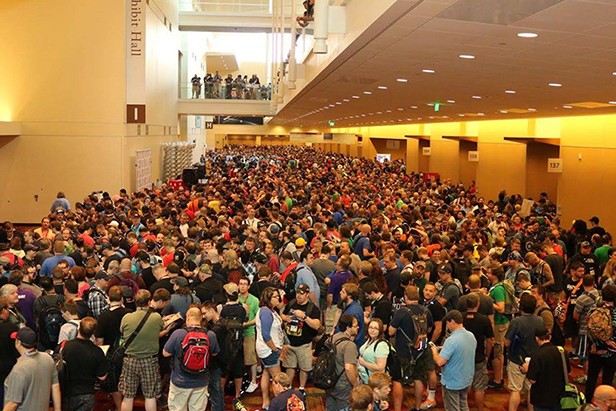 We're happy to return to this con and are ready to run some awesome events for the players and attendees there. And in October, on the 15th and 16th, we're at Zappcon in Fresno, CA! 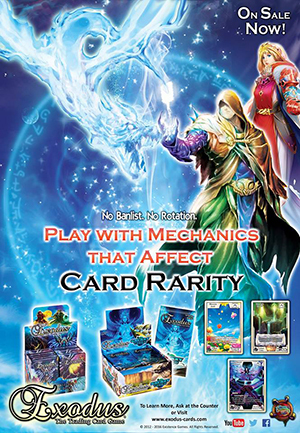 We'll be hosting lots of tournaments, demos, and giveaways for the Exodus TCG here! Come find us at any of these upcoming cons, and ask to play against one of us at our booth for a chance to win a Limited Edition sketch card (only 100 of each ever printed)! Announcing the official featured card of September! In this column we feature a new Exodus card every month. 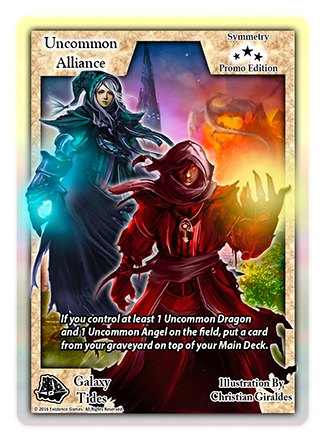 The September card spotlight goes to Uncommon Alliance! This symmetry is the product of an occurrence that no Drifter had ever expected to occur on Eeventide—an alliance between the Dragon and Angel guilds. 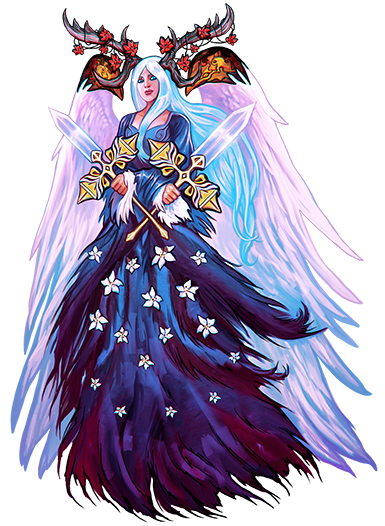 Despite the long-lasting rivalry between these two creature types, the rising Order Guild has been relentless in their onslaught, particularly towards the Skyborn (Angel) guild. Skyborn’s guild leader, Skyriss Delcastle, finally decided that desperate times called for desperate measures, and came to Hal Sinogaurd, leader of Dragonis, with an offer. Maybe this alliance is only temporary, but amidst the guilds’ new bond, they forged a beauteous and powerful new creature that would fight for Dragons and Angels alike, known as Drangel. This symmetry card’s effect reads: If you control at least 1 Uncommon Dragon and 1 Uncommon Angel on the field, put a card from your graveyard on top of your Main Deck. To get this promo card, attend a free Exodus tournament at your local game store, or find another player who may be willing to trade! You also have a chance to win 2 copies of this card by entering the Exodus poster contest (see below). 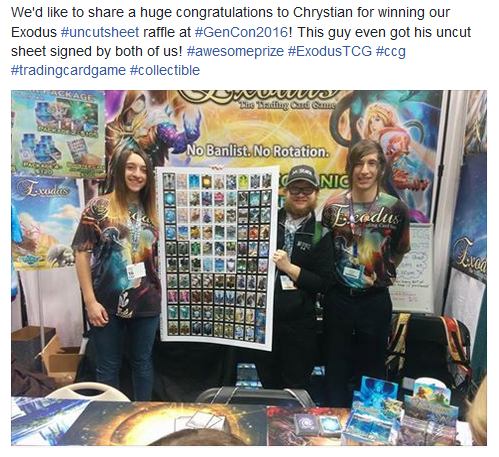 Don't forget about the Exodus TCG poster contest! 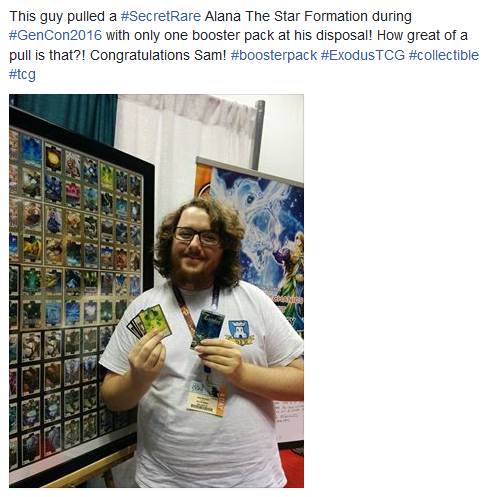 If you find one of these at a game store or convention, take a picture in front of it and post it to Facebook or Twitter using the hashtag #ExodusTCG. 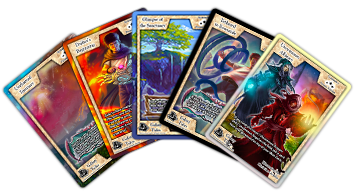 You'll be entered into a drawing to win a playset of all our new Summer promo cards! This is a really great opportunity to get some new cards that not many people have yet. Be sure to like the game on our Facebook, Twitter, and Youtube Channel, and stay up to date with all that's going on with Exodus The Trading Card Game and Existence Games! We hope you all have a fantastic rest of your week, and don't forget to share some good old fashioned tabletop game-time with someone today! After all, it only takes 5-10 minutes for a game of Exodus!